There's a storm coming to Texas. The supernatural kind. Half-demon Kalos Aeon lives by a simple code. Don't screw people who don't deserve it. Talk is cheaper than a fool's gold. And always deliver what you promise. It's why he's survived for 7,000 years. But saving the world from a Demon King he banished a millennium ago? Kalos sure as hell didn't promise anyone he'd handle that. Not that anyone else is clamoring for the job. This exclusive set collects The Complete Half-Demon Rogue Trilogy - over 700 pages of dark urban fantasy action - in a single volume for the first time. 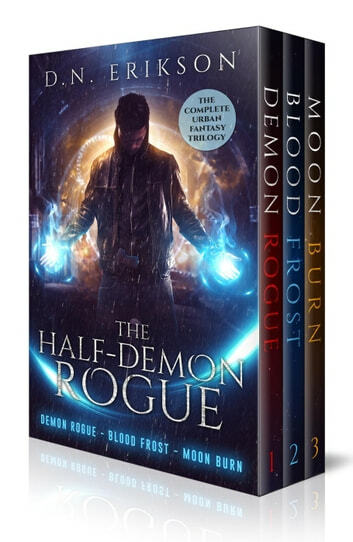 Includes all three books (the complete series) starring immortal salvage recovery specialist (and half-demon) Kalos Aeon: Demon Rogue, Blood Frost, and Moon Burn. The Half-Demon Rogue is a great book series that is based in the main character, Kalos Aeon's P.O.V. This book is great for about 13-14+ as it involves swearing but is one of those that you just can't put down.